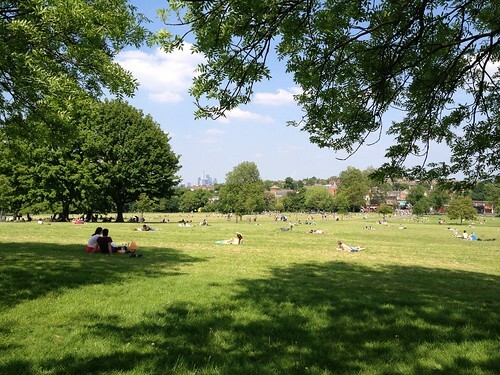 A stunning, warm sunny Sunday and a curiously empty (or, more accurately, "steadfastly ignored") To Do list meant that a little while ago I dusted off my sandals, put on short sleeved shirt, and made the five minute walk to enjoy one of Brixton's gems: Brockwell Park. If Windrush Square and Brixton Market are the bustling urban heart of the neighbourhood, the Brockwell Park is its leafy alter-ego. And the fact that it's one of London's lesser-known parks means that unlike Hyde Park, Regent's Park, Hampstead Heath, or even Clapham Common, I'd venture to say the Brockwell Park is used and enjoyed almost exclusively by people who live in the area, which makes it feels kind of like our little secret. It's big! And look, there's a swimming pool! The park, with views north to the Shard. 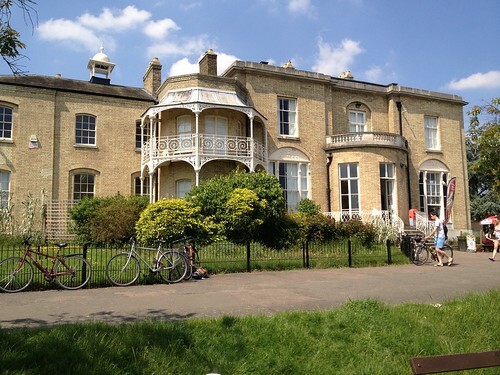 The history of Brockwell Park dates back to at least the fourteenth century when it was part of St. Thomas' Hospital, then a monastic establishment. After Henry VIII had his little hissy fit and seized church lands it became part of several private estates, finally settling in the hands of the Tulse family around 1650. The Tulses are important because they lent their name to the adjacent neighbourhood, Tulse Hill. (Oh, and Sir Henry Tulse was Lord Mayor of London at one point, but that title changes hands every year so I think that eventually everybody who's really posh gets a crack.) More important in the history of Brockwell Park is John Blades who eventually came to own the land and who built Brockwell Hall in 1811, and landscaped much of the current park. Brockwell Hall, at the top of the hill in the middle of the park, has some pretty reasonable views over the city - north at the aforementioned Shard and the City, northwest to Battersea Power Station, and south to the Crystal Palace radio tower. It also has ice cream! Now what have you gained in Brockwell Park? There is a negative advantage and there is a positive advantage. 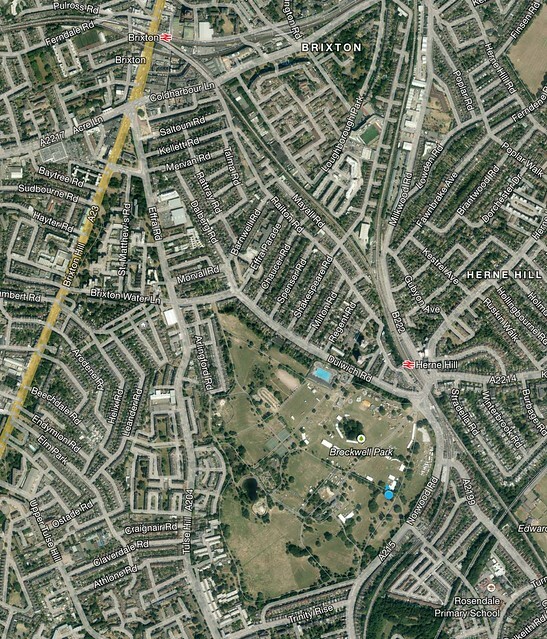 The negative advantage is this - that if we had not been able to preserve Brockwell Park it would soon have been built over. We cannot afford to lose any of the large spaces in the metropolis. We have many parks, perhaps more parks than any capital in the world; but every day, gradually and by minute fractions, the process of building over small open spaces, the suburban gardens which are attached to the villas which are every day being pulled down, every day the process of destroying these is going on, and therefore, it is the duty of that vigilant County Council that you have so recently elected to take care that, whenever a neighbourhood shows that it places a due value upon a space by contributing its own share, the Council shall not be remiss in contributing on the part of the general inhabitants of London in securing that open space for ever. What is the positive gain? Whatever revolution may occur, whatever political change may take place, the face of nature may be transformed; but, whatever happens, this is preserved to you and your descendants for ever as an open space. No landlord can take it from you, no building society can take it from you, no Monarch can take it from you; you are safe for ever and ever. It is with this consideration that I rejoice to be with you today. I spend most of my visits looping around the outside of the park on the perimeter pathways, which go past the Brockwell Lido (pronounced here as LYE-dough). The lido is one of London's few remaining outdoor swimming pools and is naturally very popular in the summer. The day I was there people were queued up outside the entrance. There's also a gym and health club with the mandatory assortment of Pilates, spinning and yoga classes. The Lido is also home to the Lido Café, which has semi-legendary Sunday brunches and really good burgers, the beef in which has been praised by my sister, who lives in ALBERTA, where they take their beef pretty seriously. I made a quick detour to The Herne Hill farmer's market to pick up a cup of coffee and a satisfyingly large oatmeal raisin cookie, and then found my own little patch of the park to relax in. Aaaaahhhhh... 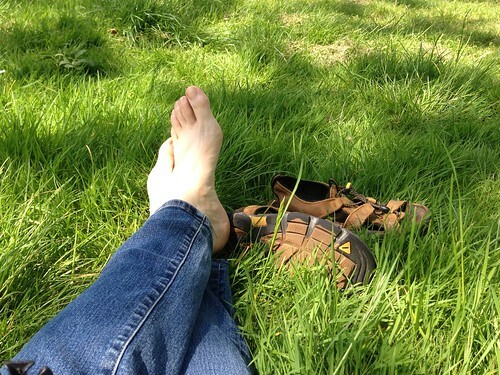 It was the first time those toes have felt green grass in quite some time. Despite living so close to the park, it's rare for me to take the time to really explore the whole thing, so I took advantage of the lazy day to discover a few of the parks more hidden spots, which include a walled garden, the existence of which I was previously utterly oblivious to. It's a lovely little spot, and even on a day when the park was as busy as it was, the walled garden was quiet and calm, with benches and gazebos occupied by people happily ensconced with a book or a copy of The Guardian (of course). 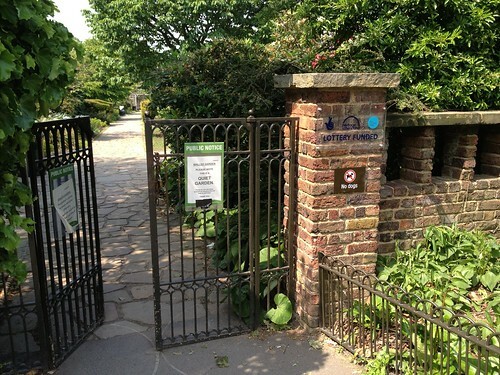 The well-hidden gates to the walled garden. It really was a great day to be in the park. Every open space was dotted with people spread out on the grass enjoying the sun, including the requisite ration of men with their shirts off. (A sad and curious habit of the English male. When the mercury rises above about 15 degrees and the sun comes out they seem incapable of keeping their shirts on, despite the fact that 97% are so pale they are basically translucent, which lasts for about 11 minutes of exposure to the unclouded rays of the sun, after which most turn the colour of a post box.) There was also a gratifying number of small children with perfect English accents, which I always find charming but also catches me off guard every time. There's something about an English accent that just seems very grown-up to me - as if it should be acquired later in life. 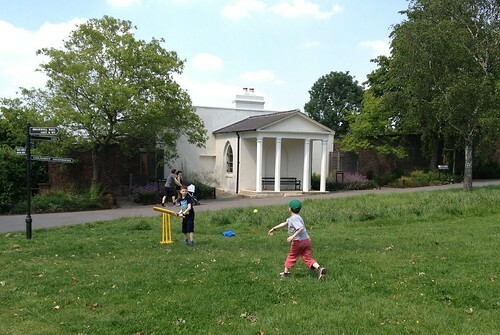 Brockwell Park also boasts a lawn bowling club, a BMX track, a duck pond, an adventure playground, and several public toilets. There was even - inevitably - a group of people drumming under a large tree. 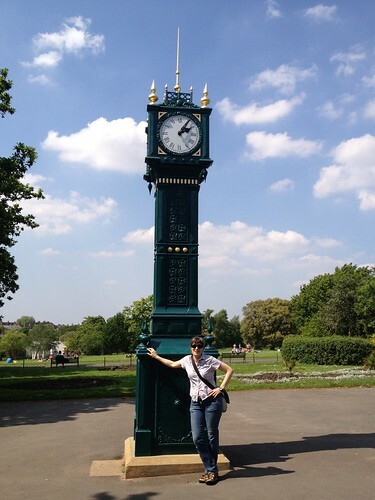 I took the trouble to have my picture taken in front of the recently restored clocktower at the top of the hill near Brockwell Hall, rested on a bench in the shade where I was gently hit on by a nice but unexciting man named Omar (who has a scrap metal business, an ex-council flat in Chelsea and a beautiful mastiff-like dog named Caesar) and then gradually wandered home, warmed through, relaxed, and feeling quite pleased that I'd had just the sort of Unplanned Nothing Day that always feels particularly rare and delicious. P.S. As usual, there are more pictures over at Flickr.